We rated, reviewed, & compared 13 of the best micro-ATX cases across various budgets. We rated each mATX case listed here based on price, build-quality, and feature set. If you want to build a small form-factor gaming computer, you have a couple of options for the size of motherboard and case you can you. One of the more budget-friendly form-factors is micro-ATX. Micro-ATX cases are a little smaller than the traditional standard ATX mid tower cases and are a little bit larger than the popular mini-ITX cases. The nice thing about mATX cases and motherboards is that they typically cost quite a bit less than mini-ITX motherboards and cases. In a lot of instances, gamers working with a tight budget can’t afford a mini-ITX case and motherboard because of their higher price. However, there are plenty of micro-ATX cases and motherboards out there that come in at a fraction of the price. So, in an effort to help you find the best micro-ATX case for your budget and needs, I’ve put together this buyer’s guide. In this guide, you’ll find 13 of the top mATX PC cases that you can use to building a new high-end gaming PC or a budget-friendly system with. The table below represents our top selections for the best micro-ATX cases across a range of categories. We’ve chosen what we feel is the best mATX case overall, our runner-up pick, the best cube-style micro-ATX case, the best value pick, and the best budget-friendly option. *To read more about each of these mATX cases, click on the “Read Review »” link to skip to our write-up on that case. You can also keep scrolling down to find more micro-ATX cases based on your budget. Unlike other more popular case form-factors, there aren’t a whole lot of high-end micro-ATX cases. The ‘under $200’ budget is the highest one we’ll cover in this guide, and there are a handful of good micro-ATX case options in this price range. For this price, you can expect to get a lot of bang for your buck. Micro-ATX cases in this range usually have excellent airflow and a nice-looking design. You’ll also see high-quality materials used for the case to create lasting durability. The cases in this price range often have additional features to make gaming experiences even better that avid gamers will love (RGB lights, PSU shrouds, tempered glass, etc.). You’ll also benefit from exceptional expansion abilities with extra internal size and slots for components. You’ll likely find everything you need in a mATX case in this price range. Additionally, you’ll get some bonus features that you won’t find in most low-budget towers, setting the options in this price range apart from the options in the lower price range. We chose the NZXT H400i for our top pick among micro-ATX cases for its unique design (and availability of different color schemes), it’s tempered glass side panel, its PSU shroud, and its roomy interior (among other things). So, if you’re looking for a micro-ATX case that looks cool and that will allow you to build a high-end system inside of, the H400i might be the choice for you. NZXT’s latest H-series lineup comes well-regarded for its unique design, its RGB control features, and the inclusion of a PSU shroud and a tempered glass side panel. The H400i is also one of the roomier mATX cases on this list with the ability to hold video cards that are up to 16.2″ in length and up to 6.5″ in height. The case can also hold up to five different fans and can hold a smaller AIO cooler (120mm or 140mm) on the front or rear of the case. NZXT also took care to ensure that a system built inside the H400i would operate as quiet as possible with its “Adaptive Noise Reduction” design. While the H400i lacks some of the features that our runner-up pick, the Phanteks EVOLV mATX (listed below), possesses, it comes in cheaper than the EVOLV and offers support for longer graphics cards and comes in more color schemes as well. Overall, the H400i is one of the best smaller form-factor cases on the market period, let alone one of the best micro-ATX cases. So, if you’re looking for a solid mATX case and you have a budget that can accommodate the H400i, it would at least be worth considering. The Phanteks EVOLV mATX is our runner-up choice for the best micro-ATX case. However, if you prefer the design of the EVOLV mATX over the NZXT H400i and you don’t mind paying a little more, the EVOLV mATX is a very worthy option that will treat you well. Another equally as impressive option as NZXT’s H400i is the Phanteks EVOLV mATX. The EVOLV mATX also comes with a tempered glass side panel and a PSU shroud. However, it doesn’t have quite as much clearance for video cards as the H400i does as it can only accommodate cards that are up to 12.5″ long. The good news, though, is that 12.5″ of clearance for graphics cards is more than enough to house even the higher-end GPUs out there. In fact, you’ll find that most GTX 1080 Tis out there come in at under 12.5″ long. So, really, you aren’t limited in terms of what you can do inside of the EVOLV mATX. The other downfall of the EVOLV mATX, though, (at least, in comparison to the H400i), is the fact that it comes in at about ~$15 more expensive. So, if you’re on the fence between the two and you like the aesthetics on both cases, you might want to choose the H400i instead and save a few bucks. However, if you prefer the style of the EVOLV mATX over the H400i, then I’d say that you should go with the EVOLV, as the differences between the cases (feature-wise) probably aren’t so significant to where you’d be mad if you chose one over the other. If you’re looking for a cube-style micro-ATX case that has a minimalistic design, you might want to check out the Fractal Design Node 804. The Node 804 is a high-end micro-ATX case that can support power systems. In our opinion, though, its main downfall is its price. At just under $130, it is anywhere from ~$35-$65 more expensive than the other cube-style cases on this list. If you’re looking for a cube-style case, one option you have is the Fractal Design Node 804. The Node 804 has an all-black minimalistic design making it a good option for gamers or professionals who don’t want the over-the-top look that some cases come with. The Node 804 also provides enough room and clearance for users to be able to build a high-end system inside of as well. It comes with support for up to 12.6″ long graphics cards and up to 6.3″ tall CPU coolers. You can also fit liquid cooling radiators that are up to 280mm long in this case, too, so if you want to put a high-end AIO cooler in it, or put custom liquid cooling inside of it, you should be able to do so. For us, the main downfall of the Node 804, though, is its price. Compared to other cube-style cases on this list (like the Thermaltake Level 20 VT, the Corsair Carbide Air 240, and the Thermaltake Core X2 and Core V1), the Node 804 comes in at anywhere from ~$35-$65 more expensive. For some users (especially those who like the simpler design of the Node 804) that price difference will be worth it. However, if you’re a bit more budget conscious, you might want to check out the other cube-style micro-ATX cases listed below. The BitFenix Micro ATX Tower is truly the ultimate in design out of any on this list. If you want the most stand-out design with the added benefit of portability, this case is perfect. Prepare to sacrifice some size, though, since it’s the smallest case we review in this category. The BitFenix Micro ATX Tower offers a design like no other. You can choose from a variety of colors, like orange, green, or plain white, but that’s not even the coolest thing. Each of its four corners comes equipped with a handle design for easy portability and a one-of-a-kind shape. The case looks like the ultimate gamer’s tower. The side windowed panel lets you see your system’s components and is likely to become a talking point with gamer friends. But, for this unique, portable design also comes a smaller frame, which could be an issue if you need the most internal size possible. Although this tower will fit well in just about any space and is super lightweight for carrying, it creates a bit of a wonky setup to make room for everything. The USB and audio ports, for example, are on the side of the case rather than the front because there simply isn’t room for them in the front. The placing makes for somewhat awkward access to these necessary ports. Still, this mATX case has plenty of room for components: 5 PCI slots, five 2.5” drive bays, four 3.5” drive bays, one 5.25” drive bay and space for slim radiators. Of course, with all this stuff packed into a small frame, it gets difficult to assemble everything unless you have tiny fingers. The case comes with a side and top fan, but plenty of space to add more if you need extra cooling. Even with its compact design, it seems to have excellent airflow with help from the vented panels. You might think that this price range will make you sacrifice several features in a Micro-ATX case, but this budget has a lot to offer gamers. Honestly, some of the most popular and most reviewed mATX cases are in this budget. For $70 to $100, you’ll find some of the most spacious options on this list. In fact, some of the options in this range are at least slightly larger than a few of the options in ‘under $200’ budget. Plus, the air cooling systems in this budget are mostly like the higher-end models listed above. Most have at least two fans with superior ventilation on the sides, rear, or top of the case. Honestly, there isn’t too much of a difference between the cases in this price range and those in the higher price bracket. If you want to save an average of $20 to $30, you can’t go wrong with the options below. The Thermaltake Level 20 VT is one of our favorite mATX cases out there. And, its unique combination of all tempered glass panels and its cube-style design help it stand out as one of the nicest-looking options on this list. It doesn’t have quite as good of airflow as some of the other options, but it does offer plenty of support for liquid cooling and for adding additional fans—so you should be able to achieve adequate—or better—temperatures in this case if you decide its aesthetics and other features are the right options for you. 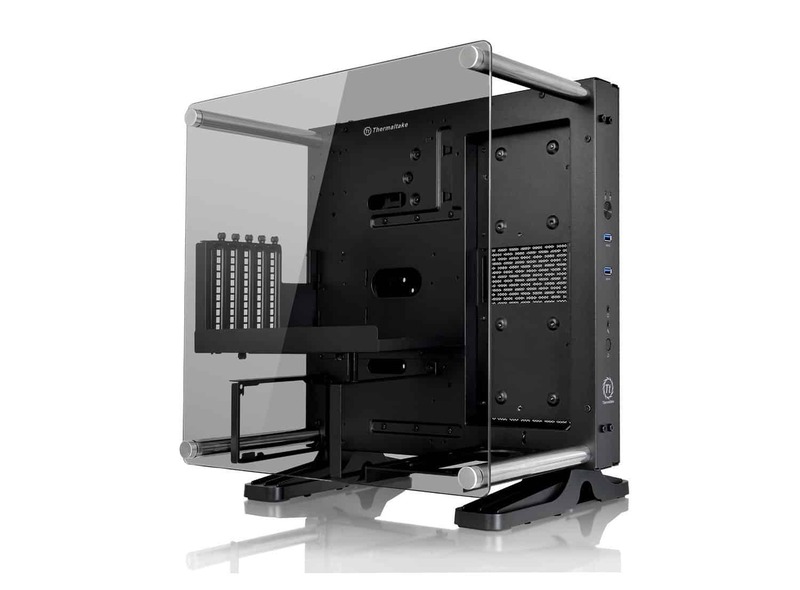 We chose the Thermaltake Level 20 VT as our top choice for cube-style micro-ATX cases. The Level 20 VT released recently and has received mostly positive reviews. It comes with four tempered glass panels, three of which are removable, on its front, sides, and top. The case has a ton of room inside of it with support for graphics cards that are up to 13.8″ long and CPU coolers that are up to 7.3″ tall. Both of those represent enough clearance to allow for pretty much any graphics card or air CPU cooler currently on the market. The case also has a ton of support for liquid cooling as well with room for up to 280mm long radiators. You can even fit dual 240mm radiators on the top panel of the case, too. The one downside of the Level 20 VT, though, is that it costs more than all of the other cube-style cases on this list and it doesn’t offer as much airflow as some of the other options on this list. However, with the ability to house up to a maximum of nine fans, and its extensive support for liquid cooling, you can potentially make up for its slightly lower levels of airflow by adding additional hardware to it. But, if you want something that will provide better cooling out-of-the-box, you might want to check out the Corsair Carbide Air 240, the Thermaltake Core X2, or the Thermaltake Core V21 below. The Corsair Carbide Air 240 provides exceptional convenience, space, and cooling capabilities compared to others in this category. No tools are necessary to add numerous components, and the open internal design with cable guidance keeps everything tidy. Corsair Carbide Air 240 is bulky but surprisingly lightweight. Its interior seems to be one of the roomiest in this category, and its price falls within just a few dollars of the others. Corsair designed this mATX case with cooling and convenience in mind, rather than looks. Its design isn’t spectacular; in fact, it’s a little strange looking. But if looks aren’t important to you, this could be just the case you need, especially if airflow is your top priority. Over half of the front and top panels have vents for plenty of surface airflow. Corsair designed the panel vents in such a way to pull cool air into the machine to cool off your components that generate the most heat, like your CPU, graphics cards, and hard disk drives. That air then gets pushed out the pack and top of the case. There are a whopping nine fan mounts on this case, so cooling shouldn’t be a problem. Additionally, you can choose to add up to three liquid cooling radiators on the top, bottom or front of the case. There’s so much space inside the Corsair Carbide Air 240 that everything will have a place. The case comes with dedicated cable housing space and routine holes so you can keep cables tidy, which is important when you have a full-windowed side panel. Plus, this helps keep air flowing through the machine. With USB and audio ports right on the front panel and tool-free component installation, this case is one of the most user-friendly at this price point. Nanoxia Deep Silence 4 has a minimalistic design but is a powerhouse on the inside. If you don’t care much about looks but do care about silence, this case allows for high customization with as little noise as possible. Plus, it will save you a few bucks compared to other comparable, but noisier, options. If a quiet gaming system is what you’re after, put all your components in the Nanoxia Deep Silence 4 Micro-ATX case. The ‘Deep Silence’ name says it all, and for a lower price than some others in this price range, you get the quietest machine that’s virtually noiseless. The Nanoxia Deep Silence 4 has a foam insulated front door to help block out the noise from its front fans, which are already customized to the machine to produce almost inaudible noise. Nanoxia keeps silence in mind by placing low-noise components in the case and designing it so that any noise created stays inside. Despite its barely-there noise, this compact tower packs a lot of customization options. It’s the smallest of the Nanoxia Deep Silence line but holds up to six fans, multiple graphics cards, up to five hard disk drives, a liquid cooling system, and more. If you need additional cooling besides the two pre-installed fans and four other fans you can potentially install, place a water cooling solution and up to two radiators, one in the front and one in the rear of the case. Your components should be safe from overheating in this case, even with overclocking your system. So, what’s the downfall? The Nanoxia Deep Silence 4 is significantly heavier than others in this guide. If you want a lightweight, portable case, this isn’t it. But when you think about everything it does provide, its heavier weight is a small price to pay for the customizability and features. The Cooler Master Silencio 352 is between $30 and $40 less than others in this category, and its design isn’t anything out of the ordinary. Still, it packs a lot into its budget-friendly frame, with several expansion slots and ample cooling. This case is the perfect blend of function and frugality. The Cooler Master Silencio 352 is the least expensive one that we’ll review in this category. It’s significantly less than them, at just about $30 to $40 under the other options. You’d think that much of a price difference would cause a lot of sacrificing features, but there’s not. In fact, we don’t see a big difference between this Micro-ATX case and the other options in this category, which makes it a bargain. The size is average – it’s not the smallest, but not the biggest. The average gamer will find it adequate to house everything internally, yet not take up a ton of room on their computer desk. Cooler Master optimized the design of this case for ample internal space and excellent cooling, rather than flashy looks. Cooler Master certainly lives up to its name with this case, allowing room for its two high-powered fans and potentially three more. Plus, you can add in two radiators, one in the back and one in the front, if you need more. For extra cooling, you can remove the top panel. Several air filters help catch dust and make maintenance a breeze. If there is a downfall of this case, though, it’s that the bottom power supply filter requires you to remove the power supply to gain access to it, which can be tedious. The ‘Silencio’ part of the name comes from the case’s noise-reducing abilities of the removable panels. They have foam insulation to cut down on noise from internal components and help to redirect noise within the case. While the cases in our $50-$70 price range are significantly less expensive than the options listed in the price ranges above, the reality is that some of the best micro-ATX cases currently available fall in this price range. All three of the options listed below serve as valid cases for the right user. So, if you’re working with a tighter budget, or you are looking for solid options that offer a good value for the price that they come in at, the options below will likely offer you the best of both worlds. With a PSU shroud, a tempered glass side panel, a nice-looking design, and plenty of room to hold larger graphics cards and taller CPU coolers, the Antec P6 is one of our favorite micro-ATX cases. But, the reality is that its best selling point is the fact that you get all of those features for just a little over $60. So, if you’re looking for an affordable case that has some high-end options, the P6 deserves your consideration. 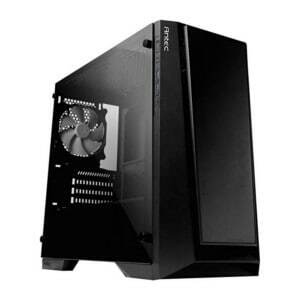 For our pick for the micro-ATX case that offers the best value for its price, we chose the Antec Performance Series P6. Why? Well, the P6 has a lot of the features that are popular among system builders right now (mainly, a tempered glass side panel and a PSU shroud) and it has an all-black sleek-looking design that is neither too plain to scare away users looking for a sexier option and too over-the-top to scare away users that are looking for a simpler design. And, it has a ton of room on the inside of it with the ability to house graphics cards up to 15.4″ long (which is enough clearance to accommodate any graphics card out there) and CPU coolers up to 6.3″ tall. It can also hold radiators up to 240mm long as long as the radiator and fans on it are no thicker than 55mm. So, liquid cooling is also a possibility in this case as well. You get all of these features for just a little over $60. So, the bottom line is that if you are looking for a nice-looking micro-ATX case that has plenty of room to house a high-end build, the P6 is worth considering. While we chose the Thermaltake Level 20 VT as our top cube-style micro-ATX case, the reality is that in terms of component clearance (space) and price, the Level 20 VT is probably an even better option. Its aesthetics aren’t as flashy as some of the other options on this list, but if you want an affordable case that has a ton of room on the inside of it, the Core X2 is an option you’ll want to consider. If you’re deadset on a cube-style micro-ATX case and you’ve decided to pass on the Node 804, the Level VT, and the Air 240, you might end up with an even better option in the Thermaltake Core X2. While the other options listed above might feature nicer-looking designs, the Core X2 offers more room on its interior and support for more fans (and larger radiators) than any of the other cube-style cases on this list. In fact, the Core X2 can accommodate more fans and radiators, and larger graphics cards and CPU coolers than any of the cases on this list. It can hold up a whopping 15 different case fans, as well radiators up to 360mm long. You can also technically run up to six different radiators simultaneously in this case as well. For clearances, the Core X2 can house graphics cards up to 18.9″ long and CPU coolers up to 9.0″ tall. Both of those figures are well over the actual length and height of any existing graphics cards and CPU coolers. So, you shouldn’t have any problems finding a video card or cooler that will fit inside of this case. Overall, if you’re looking for a budget-friendly cube case that has an insane amount of room and fan/radiator support inside of it, the Core X2 might be the best option for you. If you’re looking for a budget-friendly cube-style mATX case that can hold a high-end system inside of it, then the interior space that the Thermaltake Core V21 has and the price it comes in at will match up well to what you are looking for. Another cube-style micro-ATX case that is worth mentioning is the Thermaltake Core V21 (seriously, how does Thermaltake manage so many different lines of cases?!) It’s not quite as roomy and it can’t support as many fans (or radiators) as the Core X2, but it does come in at about ~$10 cheaper and it is no slouch in graphics card/CPU cooler clearance and the maximum number of fans supported. The Thermaltake Core V21 can house video cards up to 13.8″ long and CPU coolers up to 7.3″ tall. It can also hold up to 11 difference case fans as well as hold radiators up to 280mm long. So, needless to say, there really isn’t a limit on the kind of system you can put inside of this case. It probably isn’t suited for a quad-GPU system with an extreme custom liquid cooling setup, but for a high-end single GPU setup with a large AIO cooler, this case will work just fine. If you don’t have a ton of money to spend, the good news is that there are budget-friendly micro-ATX cases out there that will still offer you enough room and clearance to put a powerful system inside of. So, if you have less than $50 (or less) to spend on a case, that doesn’t mean that you’re out of luck. In fact, the two options listed below come in at ~$40 or less, with the Thermaltake Versa H15 coming in at just a bit over $30. And, both options are good enough to house high-end graphics cards and will provide decent (or better) airflow and cooling, too. For less than $50 you can get your hands on the compact and portable technology of the MasterBox Lite 3.1. It measures just 456mm x 208mm x 381mm and weighs about nine pounds, but it can hold the biggest graphics cards on the market, as well as the tallest CPU coolers available. Ultimately, this is an affordable case that can either house a high-end build, or a budget build that will be upgraded in the future. The MasterBox Lite 3.1 gives a whole new meaning to space management. It utilizes modular elements in the design to give you more room to incorporate larger components. At 456mm x 208mm x 381mm and a little under nine pounds, it’s one of the more compact and lightweight designs available. The Lite 3.1 can house graphics cards as large as 14.9 inches and CPU coolers as tall as 6.2 inches. Essentially, that means you can build as high-end of a single-GPU system as possible inside this budget-friendly case, as it will fit even the biggest and best GPUs and coolers on the market inside of it. It also comes with a completely transparent side panel so that you can show off your build. Ultimately, at this price, the value is insane considering the space you get. If you’re looking for a small form-factor case that will allow you to build a high-end system inside of, or even if you’re looking for a budget-friendly option you can grow into as you upgrade your system, this case fits the bill. You can read more about this case in our review on it, which can be found here. The Thermaltake VERSA H15 is an excellent option for budget-oriented gamers who need a cheap case that will allow them to build a powerful system and/or give them enough room to upgrade in the future. Thermaltake Versa H15 is the cheapest option on this list, but that doesn’t mean it’s a bad option. It does only come with one fan preinstalled, but it gives you the option to add up to four more later down the road. The design is minimalistic and the front panel is fully perforated for excellent air intake and dust-free airflow, and the vented top adds some extra room for air circulation. Where this case stands out is how much clearance for graphics cards and CPU coolers it offers (at least, in comparison to other similarly-price options). You can fit graphics cards as long as 12.4″ and CPU coolers as tall as 6.1″ inside of this case. Both of those figures are enough to accommodate high-end video cards and CPU coolers. Ultimately, for just over $30, the Thermaltake Versa H15 is the perfect option for budget-oriented system builders who need an affordable case that won’t significantly limit their component options. Which Micro-ATX Case is Right for You? Micro-ATX cases can vary in features, convenience, and design. It’s important to consider the features that are most important to you, like cooling, expansion, or portability, before settling on a budget. With that said, a higher price tag doesn’t automatically equal a better case. In fact, some of the options in this guide in the ‘under $200’ and ‘under $100’ categories offered a lot of similarities. Even in the lower price ranges, there are some compelling options. Ultimately, though, if you do need a micro-ATX case and you are working with a specific budget (whether it be a smaller budget or a larger budget), there is likely an option that will work for you in the list above. fractal design node 804 not in the list ?